We move in less than six months. (WHA???) Moves are always an opportunity for clean outs. I’m trying to do the best to use this chance to purge. On that vein, I want to make sure we use up the good stuff. I don’t want to end up with half used bottles of the good olive oil or a barely used candle. Use the nice stuff. Today. I love music. When I was a kid, I’d talk about the “radio in my head.” I would always have some song running through my mind. The problem? The kids can’t hear the radio in my head. And there is so much music I need to expose them to! And myself. Right now I really don’t have new music coming in. I also need to remember that music is one of my fastest mood changers. I think I have two issues on the music. One is a supply situation and the other is a hardware situation. First, I need to figure out the best way to find the music. Playing videos on Youtube is no longer cutting it. Should I sign up for spotify? Amazon music? Something else? This year I finally took five minutes and tackled Stitcher. That made a world of difference for podcast listening. I’m hoping I can find something equivalent to help on music. Should I get another speaker for the other end of the house? Should I get an actual radio? Should I move a computer somewhere to play CDs? I don’t know, but I’m going to work on it. Yeah. Art. This is challenging for me. I’m not a particularly neat person, but right now I just associate art with being a messy pain. But, for the kids, I want to be better. I want them to have the opportunity to make messes and try different things and techniques and be creative. It’s interesting seeing what kind of parents we are. Right now I’m definitely the “let’s go on an adventure” or “let’s read a book” Mom. James is the “let’s build some legos” Dad. I’m hoping to become more of a “let’s get our art on” kind of Mom. Because I can’t do anything without adding rules or sucking the fun out of it, I may try to make this a sort of “Project” perhaps with the eye toward writing about it later. We can tackle different art modules. Won’t that be fun, kids? I’m also planning to look for ways to outsource this as well. If I don’t want to do it, maybe I can pay somebody else to, right? I am trying to cut myself a little slack here because I can already tell some of this will be easier as Mac is a little older. But it would be better to start getting in the habit now. The gray out continues. For now. I’m not sure I’ve talked about this, but I’m also just trying to see how long my hair can get. Mid-back is fairly easily achievable, but can I push further without looking like a raggedy mess? Lots of hair plus my penchant for not washing it, means I could use a few new ‘dos. I’ve been dabbling in side braids and sock buns. I’d like to learn some new kinds of braids. Some new ways of curling it. Just some fun stuff to mix it up. And I really don’t know if the gray hair will continue, but I’m already finding that–just for me personally–I feel more comfortable if it looks like I did something to my hair with the gray. The messy hair with gray feels less cute and more just sloppy. Again, this is just me. You do you. And know that I’m coming from a pretty extreme level. I mean, I don’t brush my hair except when blow drying it . . .
As I mentioned, last six months in Europe. (Eep!) I want to be realistic, but I also want to plan to make things happen. For our last big hurrah, I’d like to do a big road trip through Spain and Portugal. I’m picturing something like flying into Barcelona, train to Madrid, rent a car for the south of Spain, and then fly out of Lisbon. I have done zero research on this, but we just got some books. I’d like to squeeze in another flight somewhere. Just the sort of long weekend, taking advantage of the fact that we live in Europe kind of trip. Right now I’m looking at Krakow. Copenhagen. Berlin. Dunno. We’ll see where the airfare takes us. I’d also like to head back to Puglia. This was an early trip of ours, and I’d love to do it again. Maybe hit up some old haunts, but try to make it farther down to Lecce. As much as I love traveling, I do love this city. The plan is to keep doing stuff with the boys. As much as we can. Particularly when it starts to warm up, we may try to meet James for Friday night dinners out in different parts of the city. I’m not saying that I’m definitely doing this, but I would like to research some kind of classes in nutrition. Right now, I couldn’t even tell you the difference between a nutritionist and a dietician, much less how to get there. Are there legitimate programs online? How long would it take? How much would it cost? It would be good to know what’s what. As my reading shows, this is a continued interest of mine that doesn’t seem to be going away any time soon. I think I’ve probably resolved this sort of thing before, but I’d like to pick one project this year and make some headway. This could be publishing that e-book. It could be launching my new website idea. It could be overhauling Roman Reboot. Dunno. We shall see. I don’t think I have another whole30 coming up anytime soon (see last 6 months in Italy), but I’d like to practice some if/then thinking around food. If it’s after dinner . . . don’t eat anything else. If you want a treat . . . drink a cup of tea first. If that thing doesn’t taste as awesome as you thought . . . STOP eating it. Basically just to be mindful and purposeful about my eating. Easier said than done, but that’s the goal. I’d like to incorporate a review rhythm into our regular schedule. I’m thinking, Sunday dinner, just have the whole family take a look at the week ahead. What’s on the calendar, what needs to get done. That sort of thing. On a monthly basis (maybe first Sunday of month), I’d like to do a deeper dive. Check in on the finances. (James is always on top of finances; this is more for me.) Poke around at what is in the pantry and freezer. Maybe even wash my makeup brushes. Possibly check in on these goals. That sort of thing. What are you resolving for the new year? Have you picked a 2017 theme? And how do you listen to music?? I’m with you on the art…let’s do it together! I’ve always felt that the mess is more worth it if more kids are entertained. 2 seems like not enough but 4 is an art party! I also have books of art ideas that I used with Mark–that lucky first child! And, Eliza is headed to school in the fall so time is running out. I am very seriously committed to this, let’s get it on the calendar. 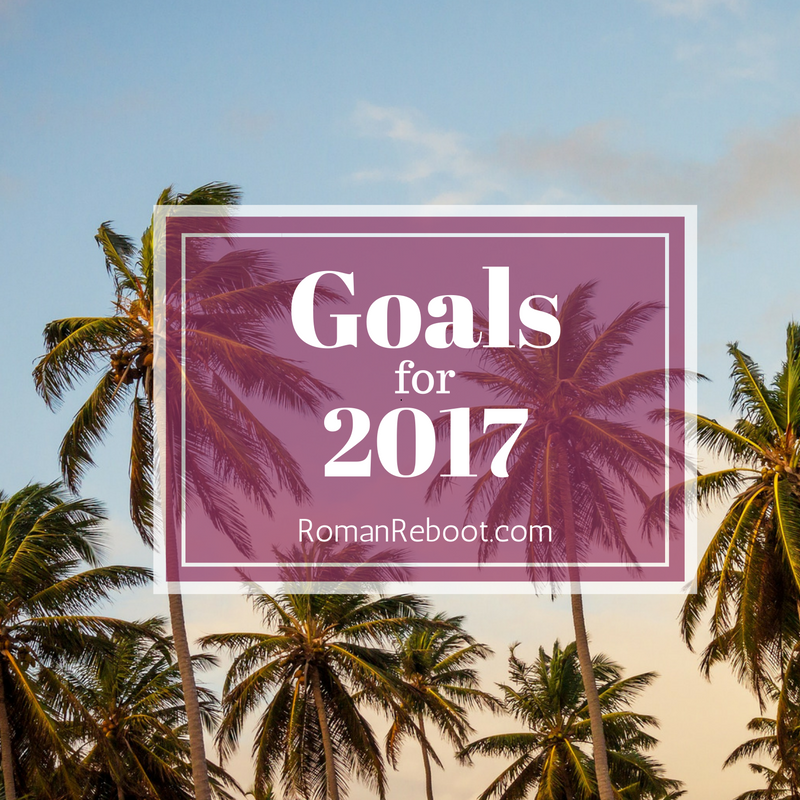 I post my goals on my blog at the beginning of the year and then I review them once a month on my blog. It has really helped me actually achieve what I hoped for. Good luck with your goals! Do you know where you will be moving to? Loved reading your end of the year review. Seems like a solid approach. We have an idea of our next move, but I’ve wanted to wait until things are more official to announce. Will definitely let you know!